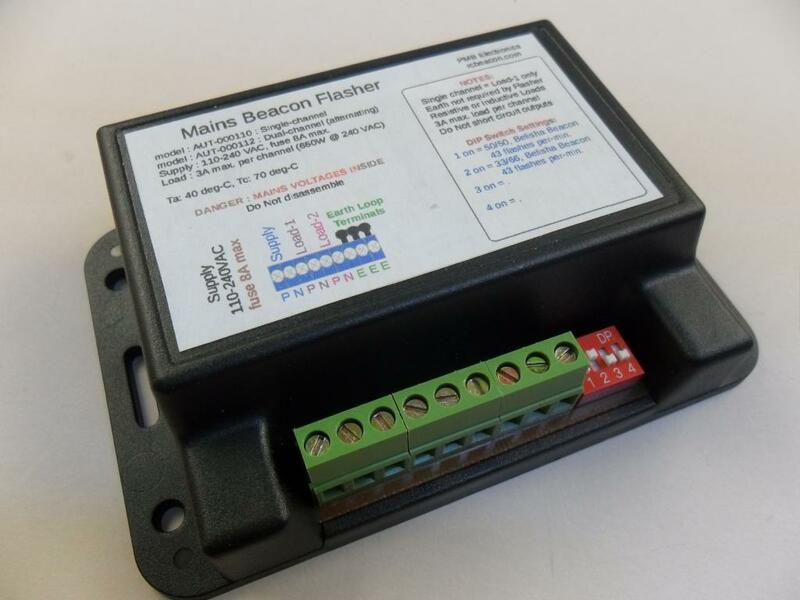 This is a mains power lamp flasher control module. Intended as a Belisha Beacon flasher but can be used to flash other lamps. A Belisha Beacon an amber-coloured lamp atop a black and white pole, marking pedestrian crossings. Common in New Zealand and several other countries. We usually have a few in stock otherwise assemble to order. Shipping/Delivery is typically one to two weeks from order if not in stock. Quantities over 20 per order may take a bit longer depending on our component stock on hand. Dual-Channel-Alternating: This version has two output channels, each rated to drive 3 Amps of load. 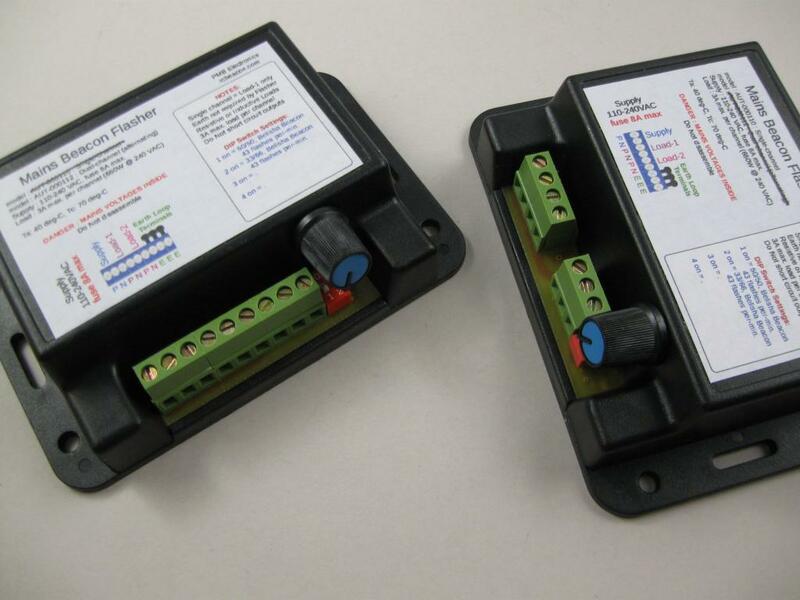 For other applications, the controller can be supplied with custom flash rates or a potentiometer for adjustment. When mains power is applied, the flasher operates. Mains power (Phase and Neutral) is connected to the left 2 terminals. The next pair (or 2 pairs) of terminals are Phase and Neutral connecting to the lamps. More than one lamp can be connected to each channel. The maximum total load connected to each channel should not exceed 3 Amps (about 400 watts). The mains supply should be protected by a fuse or circuit breaker. 10 Amps is recommended. Incandescent lamp failures present momentary short circuits causing a high fault current to flow. Appropriate protection will normally prevent damage to the flasher. The terminals will accept reasonable sized wiring. Be sure to trim ends correctly so that excess copper is not exposed. Be sure that all strands are within the terminal and secure. Do not over-tighten the terminals. The three terminals to the right are connected loop terminals which can be used to join earth wiring. An earth connection is not required for operation of the flasher, but may be required by the lamp fittings or electrical enclosure. 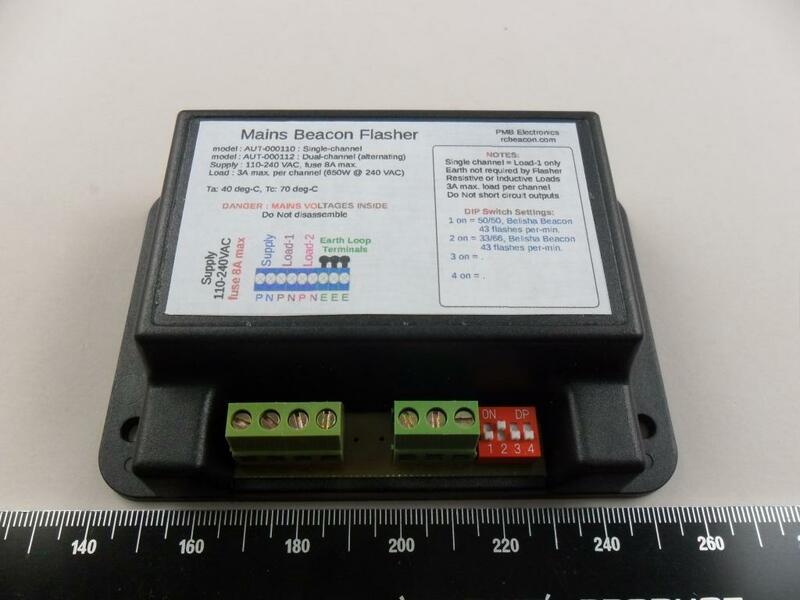 When mains power is applied, the flasher is operating. There is a pulsing RED LED indicator to the right side of the DIP-Switch. Belisha Beacon mode. 43 flashes per minute, 50/50 % duty cycle (overrides potentiometer setting). Belisha Beacon mode. 43 flashes per minute, 33/66 % duty cycle (overrides potentiometer setting). NOTE: The effect of changing the DIP-Switch or potentiometer settings may be delayed slightly as the current flash cycle completes. If required the potentiometer option controls the flash rate between about 0.5 seconds and 3.5 seconds. 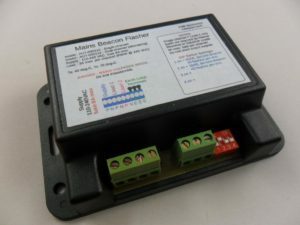 But if DIP-Switch 1 or 2 are ON, the flash rate will be about 43 flashes per minute, overriding the potentiometer. The potentiometer version is available on request at a higher cost. We do not recommend this version as continuously variable adjustment sounds like a good idea but in practice is often time consuming to set up. The flasher electronics is fully enclosed except for the connection terminals. Several ventilation holes on the back and sides allow some air-flow and ventilation of the internal heat-sink.